Two features make the iPhone great for social games: its GPS chip and its camera. An app called iSpy which was released on the iPhone last week (iTunes link) uses both geolocation and mobile snapshots to re-imagine the children's game of the same name. Players create iSpy games by taking pictures of objects in public view, which get geo-tagged and placed within a radius of their actual location on a map in the game. Other players can see which objects are nearby and try to find them. When do find an object, they snap their own picture, which is then verified by the community as either matching the original picture or not. You can also play along on the Web. The more objects you find, the more points you get. The person with the most points becomes the top spy in their city. Two features make the iPhone great for social games: its GPS chip and its camera. An app called iSpy which was released on the iPhone last week (iTunes link) uses both geolocation and mobile snapshots to re-imagine the children’s game of the same name. 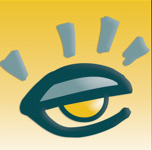 What I like about iSpy is that the iPhone game expands the playing area of the original game beyond your line of sight. You can play anywhere within a few blocks, with people you don’t know, and you don’t even have to be playing at the same time. It is an asynchronous game. It does require a certain critical mass of players creating games in your vicinity for it to be interesting. But iSpy an app that could build a loyal following.